An attractive, catchy and unique business name itself is a tool to make the company’s products or services popular. A home improvement company with a name that stands out can draw its potential customers’ attention right away. With such a name, a company can make its services a household name. What is in a name? — You may ask, but the question does matter when naming your business. After all, people will be spelling out your company’s name every time they buy your services or products. If they can easily pronounce and remember the catchy name, it will easily come in their daily talks whenever there is a mention of the industry your business is active. So, naming a company is an essential activity. This is same even with your home improvement company. Would you like to give your home improvement business just any other name in a casual manner? If the name fails to provide a clear idea of what your business is all about and how it specifically benefits customers, it is not effective. It is, in fact, going to do more harm than good to its growth. Some business owners think that they can change their company name at a later stage, but it isn’t a good practice. As a business grows, people stick to its name and renaming at a later stage becomes difficult. Remember that your company’s name is the way your brand interacts with your customers. The name of your business is significant in building a perception of your business. A thoughtfully chosen name can spread awareness about your products or services. Secondly, if the name is dull or generic and has nothing exciting in it, then customers may not be able to distinguish your business from your competitors. But a good name will make your customers attentive to all aspects of your services or products. 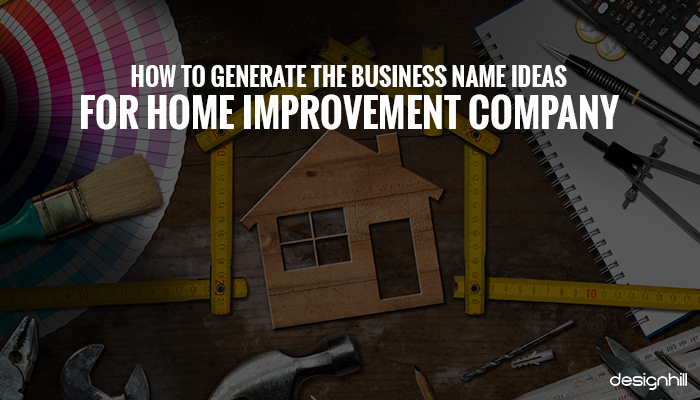 Here is a list of Home Improvement Company Name Ideas for your new startup. Your home improvement company might be in its planning stage if you’ve started its naming process. Once the name is picked, the next big thing that required is to get home improvement logo. There are many startups, small, medium and big businesses are already out there in the market. They all are your competitors. Even your smaller niche has dozens of competitors. You need to make your potential customers their heads turn to your startup venture. Your company’s name, therefore, should stand out from your competitors’ names. This should prompt you to have a big list of your immediate competitors’ name of the business in your home improvement niche. This list will guide you to know which types of names you should be avoiding to look different. Study the select list carefully, though. Looking for a home improvement logo design? While you study your competitors’ home improvement business names, focus on your own brand message. Even if the name stands out, it is merely a name if it is nowhere near in conveying what your business values are and what it stands for. To find out what your brand wishes to express, write some slogans and business attributes on a piece of paper. Then, see which of these qualities your brand wishes to reflect. Since the name will build a perception about your business, it must carry a message. This message is what customers should be thinking about your brand. So, pick those words that say something about qualities such as aesthetics, beauty, decoration, sophistication, etc that customers can associate with home improvement. The target audience or customers are the centers of any business. For example, if you run a fast food venture, its target customer will be young people. Similarly, find out which class of people from the financial backgrounds will your home improvement business is planning to target. Are the customers from high society or the middle class? Or, do you want to target average homes? Then, there are several niches in a wide field of home improvement services. For example, if landscaping is the business, then rich people are the likely customers. There are dozens of niches in the home improvement business with a different set of customers. New ideas for your business name can come from anywhere. But you can put together a team of your people to suggest you some names. Working with them will help you generate some exciting names due to a close relationship you form. You can discuss your business, your competitors’ business names, your business values, etc. Such an intimate discussion often results in some inspirational ideas. But when doing brainstorming sessions, provide the team with all the relevant details of your business. Tell them what exactly the aim behind starting your company is, and who the target customers are. What is its niche and who are the chief competitors. Armed with these details, some of your team members can spell out some exciting names. When brainstorming, instruct the members that it should be a simple name. Also, let them know what precisely a simple name is. For example, you can set a parameter that the name should not stretch beyond five letters. That will automatically result in all the suggestions of the names being five letters or shorter. Find out what other such rules can you set for the team members when generating the names. Remember that a simple and short name goes well with your logo, which is a dominant visual of your brand. Your logo designer can incorporate a short name effectively in a logo. The simplicity of the name is, in fact, the basis on which you can lay the foundation of your brand. If the name is simple, people can relate to it quickly. Take care of the psychological aspect as well. How the name evokes a feeling or emotion does matter a lot. Pick a name that can express some positivity about your business. People tend to attach some emotions to your business when they spell out the name. Therefore, make sure that the name you pick has positive connotations. The name itself must speak for your brand regarding creating an environment. It must evoke the feelings of happiness, strength, growth, aesthetics, arts, decoration, etc. To do that, you can include some adjectives to your company name. Every business wishes to look unique in terms of offering special services or products that the customers do not get from elsewhere. Similarly, business owners want a name that stands out so that it has no similarity to any extent with other names. With such a unique name, your home improvement company takes the first step to showcase your business as unique and useful to the customers. It can be said that a unique and memorable name also is your brand identity. People start associating certain business attributes and recognition with your company name. Another effective way to test if the name you shortlisted is good or not is to find out how it sounds. Some words look nice on paper. They are meant to convey meaning but are difficult to pronounce. Many such words may look simple but are, in fact, not easy to speak in a conversation. So, speak your home improvement company name loudly. If you cannot speak it out fluently and in an instant, then replace it. When you speak a word loudly, we know how it sounds. Take note of the fact that people will be pronouncing your business name on each of your products, marketing campaigns, marketing collaterals, and services. Therefore, make sure that the name doesn’t sound as something odd or weird. You can also explore some name generator software. Plenty of such software is available on the web. Just put your industry name in the search box of the software, and it will return dozens of unique names for your business. However, most names generated by software look strange. They do not appeal to the senses right away. So, use the name generator just as part of the experiments you will be doing to name your company. Note that the later stage of your business, when you will need logos, business cards, etc material, your professional graphic designer will create great designs, but if the name itself is weird, the designs are not of good help. You will be taking your business to the online audience. For that, you need to have a domain name as well. If you have picked a name for your home improvement company, but it is not available as a domain name, it will create a mismatch. A domain name and company name should ideally be the same so that people can identify your business on the web. Moreover, your business logo design will also appear on your website. In the case when the domain name is different from the company’s name on your logo, it may confuse your potential customers. Take your domain name as a solid foundation of your business website. Note that the domain name is the way your visitors will navigate your website and how people will search and get your website. A domain name is your memorable URL which should reflect your brand. To pick a right domain, avoid using hyphens, unnecessary words, and strings of numbers to ease out its registration process. If the domain has already been taken, see if the owner is willing to sell it. You can negotiate the price if the domain suits your business. Social media is where your target audience is, and you must explore it. Today, almost every business has its own social media page design to build a solid customer base in the form of followers. You can convey your brand message and new developments of your company through social media. You should not finalize a name just because it pleases you and your team. Take the second opinion as well. Circulate the chosen name amid your friends, neighbors, relatives and even on social channels. Then, ask for their feedback. It may be that some of them can suggest a better name. So, make sure that the name is available to your company as your social media handle name as well. In that way, you can ensure brand consistency. So, consider these fundamental and vital tips when you set out to give a perfect name to your home improvement company. But, most importantly, have patience as the process may take time. Sometimes, the name strikes the mind in an instant as an inspirational and creative idea. But generally, the process takes a long time before you finally get a name that is available as a domain name and social handle too. Now that you are naming your business, have you also thought of creating a nice logo, business card, website and other things by graphic design services to take the company to the people? When you think of having a memorable logo that goes well with your new company name, Designhill is the platform that can help in many ways. As you launch your design contest with this marketplace, you get access to dozens of designers. They will submit their design ideas, and you can then pick the one for your business. When planning to start a home improvement company, choose a perfect name so that people can know what your business does. The name should also be able to tell how your business stands out from your competitors. It should be catchy, simple, and unique that everyone can easily spell out. With such a name your company can hope to build an excellent customer base.